Road Trail Run: Garmin Fenix 5X, Forerunner 935, Running Dynamics Pod-Reviews and Comparisons. In Action! Which to Choose and Why. 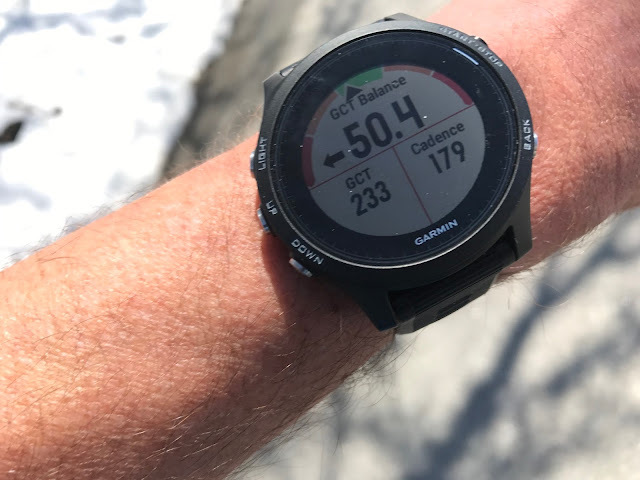 Garmin Fenix 5X, Forerunner 935, Running Dynamics Pod-Reviews and Comparisons. In Action! Which to Choose and Why. As is their practice, and like clockwork, Garmin has begun releasing their 2017 fleet of new marvels. First to launch and starting to deliver in April the Fenix 5 in 3 "flavors". Fenix 5S ($600)-A smaller diameter lighter model at 67 grams targeted at women in elegant colors providing a full featured option that it isn't massive. Available now. Fenix 5 ($600)- a direct replacement for the Fenix 3 HR at about the same weight at 86 grams with the longest battery life of the series and 8 hours more battery life than the Fenix 3 HR at 24 hours in full tracking mode and up to 75 hours with 1 minute GPS sampling and with a higher resolution screen than the 3 HR. Available now. 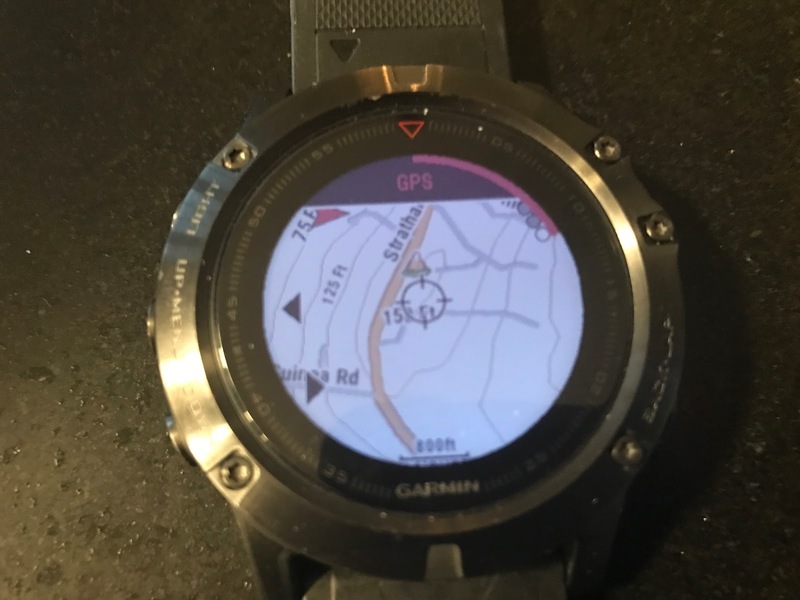 Fenix 5X ($700)- all the features of the other two with full on board road and topo maps, turn by turn directions on roads, and route following over the top maps. The heaviest of the three at 98 grams the 5X has up to 20 hour full tracking mode battery life, up to 60 hours in UltraTrac 1 minute GPS sampling. It has the highest resoluton screen of the three Fenix matching the new Forerunner 935 at 240 x 240 pixels. Available May 2017. Note: November 2017 Fenix 5 series are $100 off retail prices above. The only feature not shared in common with any Fenix 5 is the mapping of the 5X. The 935 matches the Fenix 5 and dated looking 920XT with 24 hour full tracking battery life with wrist HR monitoring which the 920XT doesn't do along with a barometric altimeter for vertical tracking feature in a 10 gram lighter watch but... "only" has 60 hours in one minute GPS sampling mode. Not many will need the extra 15 hours of the Fenix 5! Unlike the 735XT whose largely unprotected screen edge always worried us, the 935 has a real bezel (fiber reinforced polymer) which is lighter than the yet more rugged stainless steel bezels of the Fenix 5 series watches. It also for sure looks much like a training watch, without the rugged elegance and super solid feel of the new Fenix. Not skimping on battery life, the 935 matches the Fenix 5 with a 24 hour full tracking and HR battery life. In a big upgrade from the 735XT and as included with the Fenix, the 935 now includes a barometric altimeter, as the Fenix have, which allows the watch to accurately track vertical efforts including with elevation profiles along with speed of ascent and descent and weather trends. The new Fenix Series and Forerunner 935 all benefit from a tweaked user interface including watch face complications and a clever short cut menu access via holding the backlight button. Watch our YouTube demonstration of smart watch features of the 935. All features and the interface are identical for the Fenix 5 series watches. 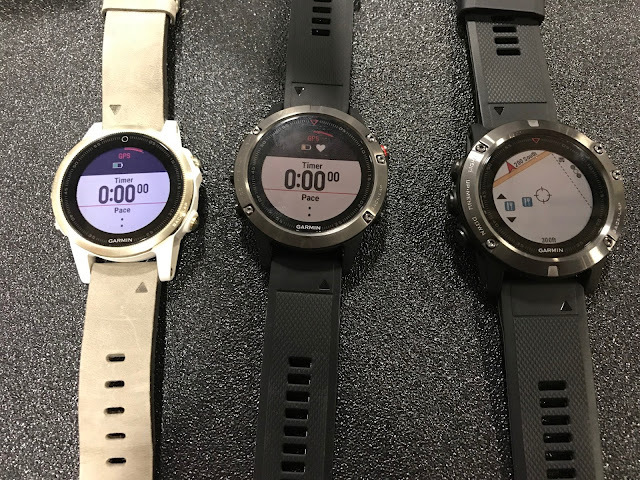 The 735XT, 935, and Fenix 5 series all also can be used with the new Running Dynamics Pod ($70). No longer does one have to rely on the Garmin chest HR and Run Dynamics strap. Good riddance as for most uses, except in water HR, the Elevate wrist heart rate on the Fenix and 935 is excellent. The Pod clips to the back of your shorts and measures stride length, vertical oscillation, cadence, the very important ground contact time metric, and left right balance. I like to focus on cadence, ground contact time and stride length the combination of which gets at my bio mechanical efficiency on the run. All of the data transmits to two screens in real time. They appear automatically when the pod is in use within your chosen run mode. The watch even reminds you to remove the pod after the run. The short clip is very secure but I worry it may be easy to lose and wish for a loop and thin cord to clip it somewhere post run. Given the features of the Fenix series and 935 are essentially the same your choice comes down to budget and sizing/watch weight. The mass of a watch and its diameter can not only cause comfort issues and may or may not be aesthetically pleasing depending on your wrist diameter but can affect the performance of the wrist heart rate sensing. To heavy and large watch for your wrist can cause the sensing to think arm motion is in fact heart rate leading to high spikes generally corresponding to your cadence or the pendular effect of your arms. These high spikes may also in part be accentuated by lower blood flow particularly on your non dominant arm further fooling the HR sensor as well as when grasping handlebars on a bike. I have seen this problem with just about every wrist based sensor including the very heavy Fenix 5X on my left non dominant wrist except, so far, with the light 935. The screen shot below illustrates the 935's steady performance on a recent progression run where I was under dressed and had chilled hands. Update: Reader Aryan of Melbourne Australia noticed very high spikes with his Fenix 5 while walking, likely due to more vigorous arm swings creating a pendular effect and especially while cycling on rough roads. He did a number of tests putting the Fenix 5 on the underside of his 18 cm wrist which helped smooth the data while cycling. See his bike ride HR graph from a ride on rougher roads below.Thanks Aryan! Heart rate accuracy and on wrist comfort is also affected by the back of the watch. In the picture above top to bottom we have the 935, Fenix 5X, and Fenix 3 HR. With its 2017 watches Garmin has made the heart sensing module lower profile and has made the rear of the watches smoother. Further they have reduced the size of the strap hinges of the Fenix 5 series. Not only lower profile but the hinges also can quickly release the strap to change to say for example a fashionable leather for dressing up. The 935 strap is thinner and stretchier making fit even tightly cinched very comfortable. The hinge and back design and more pliable strap of the Fenix 5X at almost 20 grams heavier than the 3 HR is far more comfortable than the 3 HR. On the Run Forerunner 935 Screen Views and Course Navigation. By holding down the left side Up button I accessed the menu of options for my run. This menu can be accessed at any time during a run to change settings. You can change many parameters from the work out's data fields to setting alerts, auto pause, auto laps, enabling elevation profile view which I enabled, etc... All can be accessed from this menu. I selected Navigation where I could have also selected Back to Start or even re run a recent activity. I then selected Course where my pre loaded run appeared. Launching Course took me to my normal run stats fields on the go plus a line map of the run to come as shown above. The red arrow indicates North, the green line my course the blue arrow my direction with the gray pin my starting point and the red the finish. The +/- symbols let me zoom and by pushing the start button I can switch to up/down or left/right pan of the map. Note the map only has a line to be followed. No road or terrain detail. The 735, Fenix 5, and Fenix 5S all navigate this way. The Fenix 5X is the only model with phone free maps loaded including topo and road maps and if you follow roads turn by turn directions. You can also follow a pre loaded course as on overlay on Fenix 5X map layers. More on this below. 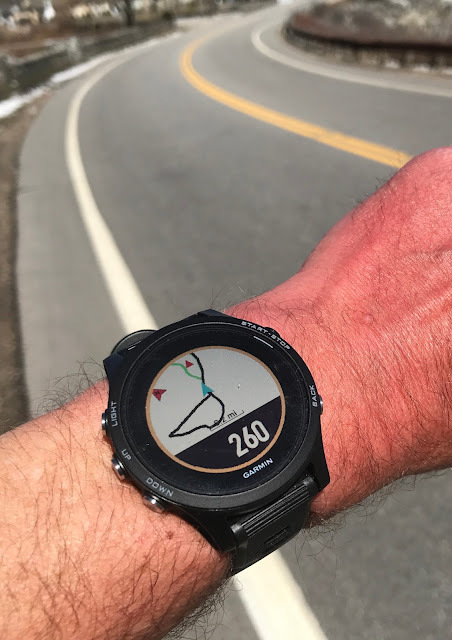 All is what one would expect of a good GPS watch, the usual pace, solid heart rate, and average pace with a second screen set to lap stats, a third just to heart rate, and a fourth to time of day. Wait what do we see below? I'll admit this was a very flat course along the ocean but my pre loaded course and the fact I enabled the elevation profile screen had me seeing the feet climbed at a point along my Course and the remaining climb to come. The Run Dynamics data appeared on two separate screens which came into the mix only because I was wearing the Pod. Not to bad for me the cadene and GCT (Ground Contact Time) but maybe a bit optimistic? Then I pulled a trick... I deliberately went off course, the black line. When I went off the course the watch vibrated and showed a message of "Off Course" on screen. As I continued "lost" of the several navigation screens indicated where I was in relation to the course, the green line, and the distance to return home. I corrected course by making a small loop back and as I approached the course, the road junction on the left at the bend in the road the 935 indicated how far to go to that turn, 260 feet. Remarkably accurate. Another screen indicates distance off course, direction to the course, and distance remaining to finish the course. In addition to the map view there is a screen indicating distance off course and general direction to get back on course. All is well with this screen in this view but when I was "seriously" off course, by a 1/2 mile or so with about 3.2 miles to get home it indicated I had 7 plus miles to go. I notified Garmin of this potential bug which they were aware of and likely a related one on the screen below, a snapshot taken as I got back on course at the intersection. I continued about an another 1/2 mile and was about 3 miles from home and on the course at this point. ETA indicates time of day I am expected to finish at the current average pace blank likely due to the bug and not seen under the On Course banner the estimated time remaining to finish at the destination. These are minor issues which surely will be resolved. Otherwise the 935 to date has been accurate as far as distance and pace. I have been particularly impressed by the lack of high HR spikes so commonly seen including on the heavy Fenix 5X on my thin non dominant wrist. Update: Garmin thanked me for identifying these 2 bugs. One is fixed and will be in a release soon, the other is being worked on and will be also come out soon. Always tickled to help make great products even better! 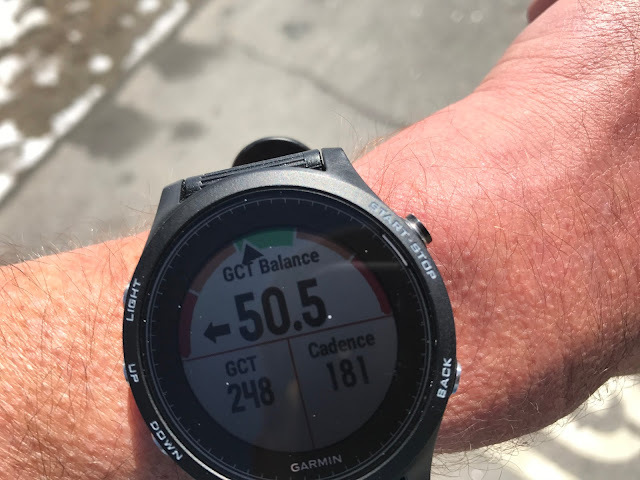 Update: Readers asked what is seen when following a course built by selecting road segments in Garmin Connect. Here is what I found. 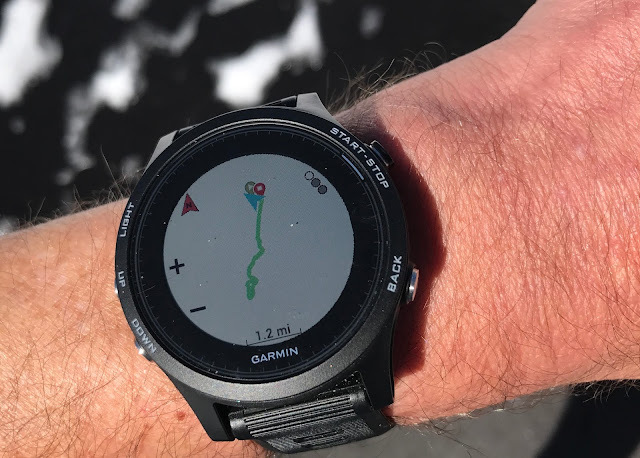 Unlike the GPX file from a 3d party such as Starva as above, with a course built in Garmin Connect you get distance to the next turn, but no indication on the map of direction of next turn as in turn by turn built by the watch itself. It is unclear if this mode gives you a vibration or turn indication at the turn as the bottom of the screen went black at the turn, unlike with the the turn by turn. I suspect it should but will confirm and there is a bug which I will report. If off course it behaves as with my GPX file course in the example above, alerting you on screen and then showing you distance off course and direction back to course and once on course an alert to say you are back on course. I also noticed that the Garmin Connect maps were about 100 feet off in terms of distances to a turn, further off than with on watch apps. I imagine Garmin will be adjusting this and will also report this. Keep in mind the Fenix 5X is just now approaching final release. While the 935, 735XT, and Fenix 5 and 5S will give you the mapping shown above the Fenix 5X takes on the wrist mapping and tools to a whole other level. Not only does it have full topo maps of the entire US on board, other continents getting local packages so verify what you can expect outside the US but it also includes road base maps for the entire US. 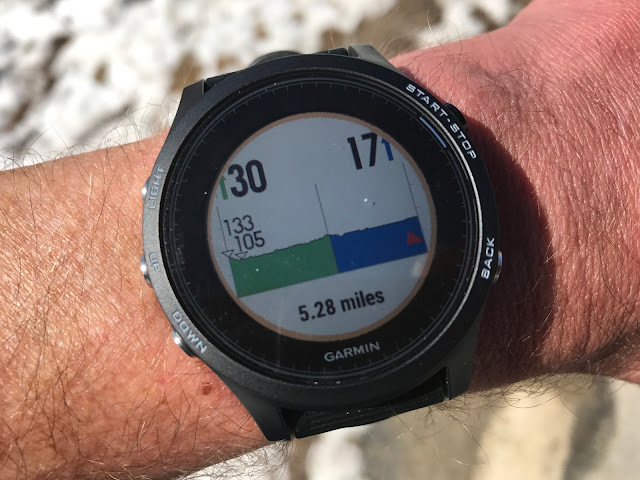 Essentially Garmin has put its car GPS system complete with turn by turn directions, points of interest, etc... into a stand alone phone free watch solution. The maps are in layers and can be turned on or off. In the picture below I have the topo maps as on overlay over the base road map layer. Garmin also offers a selection of other types of topo and outdoor maps for the Fenix 5X for purchase here including 24K topo with turn by turn directions for certain trails, bird's eye satellite imagery, and others but I have not yet tried these. Below I zoomed in on the Appalachian Trail. The contour lines shown seem to vary by zoom and maybe by location as well as above I see 25 foot contours in a flat area and below more like 75 feet. If you overlay one of those GPX courses as described above you will be able to follow it over the map but you will not get turn by turn directions. You will get the on and off course indications as shown above for the 935. I will soon test a GPX over topo map and update here. I selected the Navigate activity app on the watch, decided I wanted to run about 7 miles from my location with the option of going in any direction or N, S, E, W and the 5X capably proposed several alternatives. Imagine the utility of this feature will traveling and running in an unfamiliar place to help suggest a course. Once underway the watch vibrated on my wrist as I approached my next turns indicating distance to the turn and next direction. Also imagine the utility of this feature for cycling. When I went off course it suggested turn by turn directions and distances back to my course. Note that the turn by turn directions only currently work when you use roads in the "Cycling Base Map" of all US roads. My understanding is that for other continents where the Fenix 5X will be sold their local base maps will be included. If you are navigating trails you will see full topo maps as illustrated above but only your location, and if you loaded a GPX course, your position on a "real map" relative to the track. Garmin is checking but it is possible that hard turns on a loaded course may trigger an advance warning. As with the 935 line map it will signal you when you are off course and distance and direction to get back on course and tell you when you are back on course. Topo maps and GPX route following of the Fenix 5X promises to be a great tool for trail and ultra running as well as hiking. I suspect it will not be long extensive trail course files, for example those found in the GAIA app can be loaded in similar fashion to the road maps, with turn by turn directions then enabled. You can also access the maps at any time even when not in workout mode. Yup, I am on the middle of the bridge shown on the map below, the blue triangle, and my wrist is pointing down river, North being the red arrow top left on screen. Watch RTR's YouTube demonstration of the Fenix 5X turn by turn directions features and what happens when we go off the set course. The Fenix 5 and 935 are superb state of the art training and everyday watches with extensive capabilities for multi sport athletes and serious runners. Many factors including wrist size, watch weight and comfort, need for full mapping capabilities, if you intend your new Garmin to be both a top end training tool and also a stylish any occasion smart timepiece should be considered. The basic training, watch interface and battery life characteristics are essentially the same for the 3 new Fenix series watches and the 935. Those who have 2016 top end Fenix 3 HR now selling for $450, or are considering it, may find it difficult to justify upgrading unless they are seeking a lighter watch with full capabilities, the 935, a stylish watch for smaller wrists the 5S, or the mapping capabilities of the 5X. Those who have the 735XT might consider upgrading to the 935 or Fenix 5 for the 10 hours of additional battery life with wrist heart rate in the mix and lengthier UltraTrac mode, the bezel protecting the screen edge, the vertical features given the now included barometer, and the new Training Load and Training Effect features. Those with the 920 XT might consider upgrading for the 935 and Fenix 5's wrist heart rate with no impact on the 24 hour battery life, the barometer and vertical features, higher resolution screen, and more modern case and interface design. Please feel free to comment and ask questions in the comments section below! Sam is a 1:38 half marathoner on a good day. He runs approximately 40 miles per week. He is the Editor and Founder of Road Trail Run and has been running for 45 years and has a marathon PR of 2:28. Sam is also the Senior Contributing Editor for Fitness Wearable Technology at Competitor Magazine. The Garmin watches were provided at no charge. The opinions herein are entirely the author's. 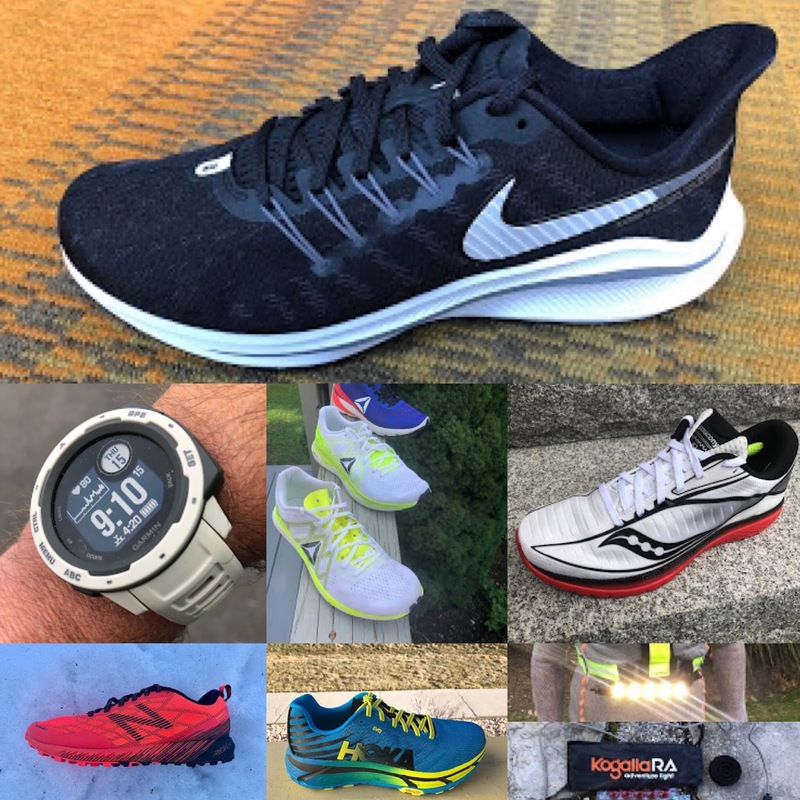 Click Here for Latest Running Shoe and Gear Reviews, over 65 in 2016, 25 in 2017 so far! 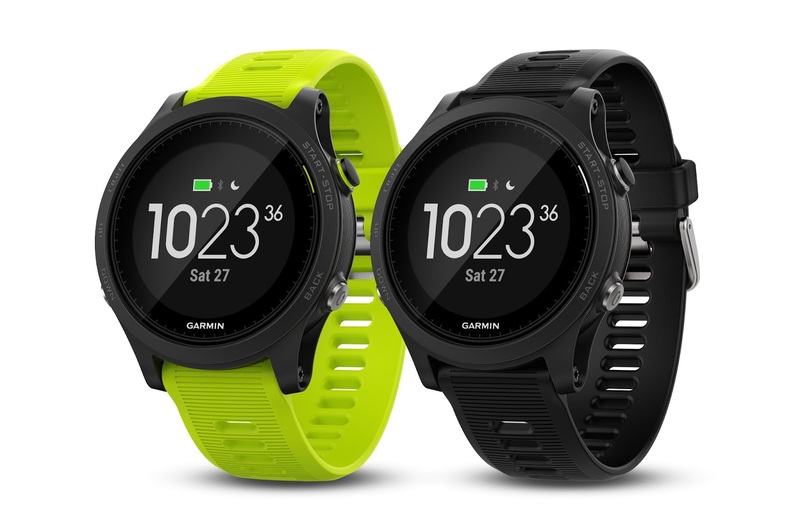 Shop for Garmin Fenix 5 series, 935 and all Garmin at Running Warehouse US here. Fenix 5 Series Now $100 Off! It seems as you suggest that these watches are meant to be substitutes for the Fenix 3-line. However, how do you compare the watches (more specifically the 935) with the 735XT? Do you think Garmin will announce a new running-only watch soon? I don't see much reason to upgrade from my 235. I use dwMap for navigation. Hi Brian, I have no updated information on any new watches to upgrade the 235 at this time but as the 235 is now on sale at Running Warehouse and if Garmin follows its usual releases I expect we will see run focused watches from them in 2017.
thanks for the in depth comparison and live pics. Very informative! Do you have any idea, why the fenix 5 having a metal housing shows up thicker than FR935 in garmins spec? I dont get, why the metal housing will give a thickness penalty?! Perhaps i missed it, but I didn't see one of the oddities of the Fenix 5 vs 935 comparison: the cheaper, plastic 935 has WiFi, which the Fenix line does not except with the more expensive Sapphire version. So to get WiFi, which automatically uploads to your computer, etc, you can either buy the $500 935 or the $700 Fenix 5 Sapphire. With your wrist size, given the choice, would you go with the 935 or the 5S? Hi Anonymous, Given my wrist size I would choose the 935 as a run training watch but if I needed a watch that was more "stylish" even thought the 935 is way more regular watch like than the 735 due to the bezel I would go with the Fenix 5, 3HR fits me fine despite size. Big caveat though if I did more trail running and I do some that's for sure but not as much as road I would go with the Fenix 5X, no question. Same answer for hiking, trekking, etc... The main issue being the thickness and weight. Great piece of review / comparison unfortunately I still cannot decide, maybe you can assist. 3 x Ironman with Lanzarote planned in 5 weeks and proud owner of a 920XT which i simply can't imagine training without now ha. Basically for me it boils down to 935 for the weight or 5X for that mapping function. The set a distance, rough direction and go would be ideal for working away etc. Price isn't an issue but unfortunately i can't afford one. Simply for me is the 5X a practical Triathlon watch especially considering the daft money we spend on bike gear to save 50g ha! Any issues with sea water? Answering my own question here but it would appear its all in the wear and the Fenix and 735 have to be tried on the wrist to know which is best for you. Whoops, I meant i can't afford both watches! I certainly am buying one of them ha! I hear you a tough decision. There should be no issues with seawater and certainly no different than for 935. Fenix 5X is a heavy thick watch so weight may be a concern. Screens have the same resolutions battery life in tracking spec the same. It comes down to 3 things: the full mapping which can be very useful when traveling and certainly on trails for the tops, the weight size which is lighter than 5X and trying both is important and may and I just say may as 935 has a less substantial bezel may be a risk for hard dings, and finally style and use as an every day watch if you plan to do so. I will say Fenix 5X is so thick with a wrist button shirt it is a big of work to get at it to see the time! Hope this helps and when you decide you consider purchasing through the links on my review. Sam, Editor. Thanks for the great review. I purchased the Forerunner 935 and was supper happy with how light it is on my wrist as I was wearing it 24/7 However, my only concern was about the possibility of breaking the glass or the watch itself since the glass is not scratch proof like Fenix 5 Sapphire edition. So, 3 days ago, I exchanged my Forerunner 935 with Fenix 5 Sapphire edition. To be honest, I love the look of the Fenix 5 Sapphire edition but hates the extra weight on my wrist. Although it is almost 36g heaver than Forerunner 935, I can still feel it like 300g more! Now, I am a bit paranoid with the wrist heart rate monitor on Fenix 5 now since I read your article. What I noticed with the forerunner 935 was that my heart rate graph was quite steady like the photo you posted on the blog on my 5k runnings with average pace of 5:20 however, the Fenix 5 Sapphire edition's heart rate graph is not as smooth or steady as Forerunner 935 when I do like a 10k walking! I can clearly see some spikes in the graph with lowest avg heart rate at 84 and highest at 137. Now, I feel I need to return the Fenix 5 and get the Forerunner 935 again! What's your opinion? I have not got a chance yet to try it while doing a 5k run yet but I expect the same result! Are you concerned about build quality of Forerunner 935 and durability of it? Hi Aryan, Thanks for reading and writing! Let's just say I have less concern about the 935 than earlier 235, 230, 735 as 935 has a bezel which others did not. But clearly not as rugged or heavy as the Fenix 3 or 5's. 935 does look more "plasticky". You can find screen protectors at Amazon to help protect from scratches but personally I need to see the watch as clearly as possible. You say: "I can clearly see some spikes in the graph with lowest avg heart rate at 84 and highest at 137". These do not seem particularly unusual unless they spiked or dropped for no good reason: the low because you stopped, the high because you were putting in more effort. 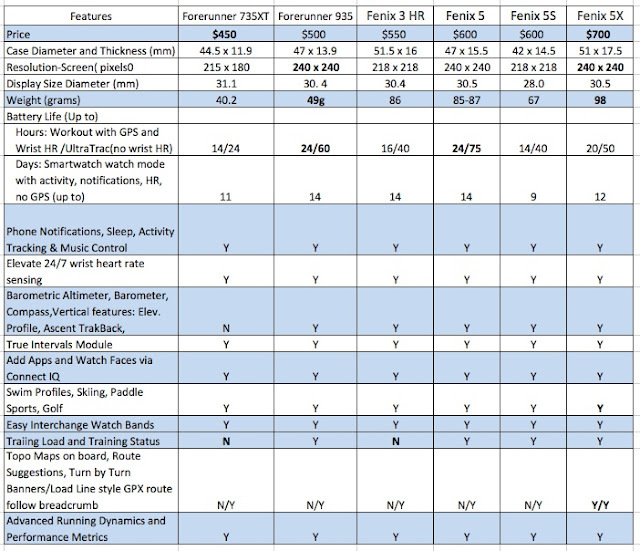 The sensors and the rest of the innards of the Fenix 5's and 935 are exactly the same. 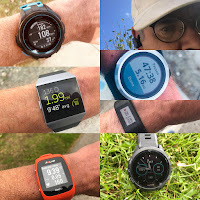 Differences and irregularities could come from a defect in the Fenix doubtful, or more likely and well known that the smaller the wrist and the heavier the wrist "pendular effects" where the sensor is fooled into thinking your cadence is your HR. Do you for example swing your arms more vigorously while walking than running? Do you have a small wrist? I do and see more irregularities the heavier the watch. Dry air and skin tone can also affect. As in the article you can try it on your dominant wrist and away from the wrist bone. Generally right handed people's dominant wrist is their right but... most wear a watch on their left. The watch should be more snug while exercising than other wise. Feel free to send me graphs at roadtrailrun at gmail.com. Hi Sam. Thanks for the insightful review. Simple question, do you have any clue when Garmin plans to officially release the Fenix 5x in the US? I'd say their "launch" plans have been a little frustrating as to the lack of visibility to when they'll actually be available. Thanks! At one point, about a month ago I recall seeing 3-5 weeks on the Garmin site but now they have an email notification box. I will inquire. Bunch of people have demonstrated pretty poor GPS accuracy of the F5 series, even somewhat compared with the F3 series. This is presumably because of the (continued) metal body shielding the gps antenna. Given the 935 is plastic, do you have a view of the 935 having same/worse/better GPS accuracy than the F5 series? I haven't seen that direct comparison yet..
Hello Sam looking to get into a Garmin we live in Montana so yes hiking and camping hunting ect. I run equipment at a mine so it needs to be durable and the 2 I have been looking at are the 5X and 935 tour opinion would be great! Hi Jason, Thanks for writing. Given your work, hunting, camping, running, wilderness etc.. I would lean towards the extra durability, and mapping capability of the 5X. While the bezel of the 935 is certainly far sturdier than the older 735 it is not the stainless protection of the Fenix 5 series. This said the 5X is heavy and if you have a small wrist will not be as comfortable with potentially issues with heart rate accuracy. Hope this helps. Thanks for the great review. I am currently looking to upgrade from a Fenix 3. I primarily Mountain Run and Hike. Was going to go Fenix 5 but now am wondering about the 935. I used to have a 620 and never had problems with durability, even when falling, so I wonder if the 935 will be fine. I also like wifi uploads - so much faster. Thoughts? Also, I was looking at the Whoop, does the recovery features on the Fenix 5/935 make the Whoop redundant? Can I essentially get the same training features on the watch? Hi John , the 935 should be more protected for sure given its bezel than the 620 but less so than a Fenix which has a metal bezel. The Whoop is not redundant at all. First, its sleep monitoring is far more sophisticated getting at sleep stages given it uses HRV which the Garmin doesn't yet. Second while sometimes puzzling the combination of sleep quality and HRV in the Whoop gives a truer indication of physiological recovery. I say puzzling as while I do not have reason to question the data it does not factor in delayed muscle soreness. What I am finding is that after a hard hard effort my Whoop recovery score the next day can be very high, I sleep very well and HRV is high. And then consistently the recovery declines after for a few days. Tells me the usual Tuesday speed after Sunday hard is to be taken with caution. Wednesday a better day. Another key thing it has showed me is the impact of my spring seasonal allergies on recovery. Even if I take it easy the day before my recovery scores are lower than expected on those warm pollen laden days. So as I head out to run I know to expect not quite the zip that a cool damp day would help provide. As far as Garmin it gives you a recovery in hours after a workout that's pretty much it. I do find that the Training Load screen, Intensity minutes, and Stress Scores are pretty good at evaluating where things stand and get more directly at your actual training. Getting the Whoop really depends on how intensively you want to evaluate your status and the $500 cost of the Whoop, We do have $50 off coupon at the end of our review http://www.roadtrailrun.com/2017/05/whoop-strap-20-review-novel-approaches.html. While simple and easy to understand it does go deeper and can really illustrate trends and the effects of changing behavior training and otherwise on recovery if you watch closely and associate the data to your daily life and training. Hope this is helpful.